The end of the year is approaching and another fresh start is beginning! Welcome it to giving your home a clean vibe! 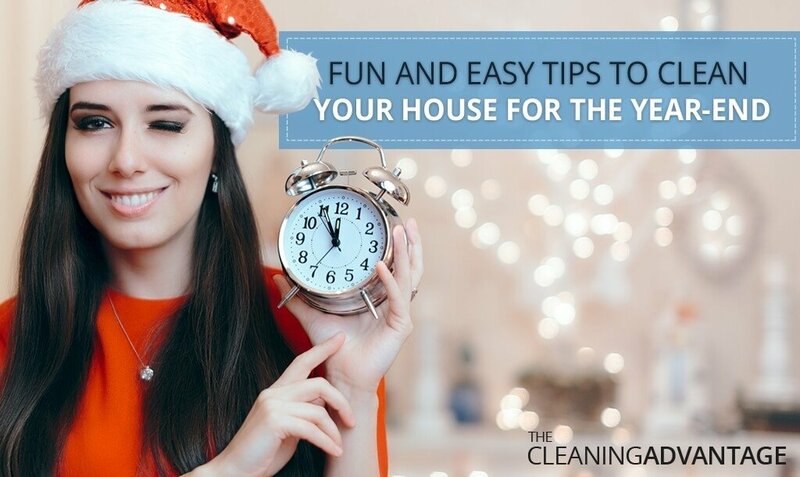 Here are some tips to prep your house clean for the year-end! A general tip that can guide you is “don’t wipe any surfaces taller than your tallest friend.” Instead of the feather dusters, use the soft microfiber cloths or the electrostatic dusters. The easiest way to pick up cat or dog hair is to put on a wet rubber dishwashing glove. Wipe your hand over the surfaces and the hair will stick right to it. Try to set yourself a timer for every chore. Let say, for about 30 minutes you should be done picking up the clutter from your room. It helps to stay focused and get things done in a short time. A nice hack to try is to spray shaving cream into a small foamy pile and dab it to remove any red wine spills from carpets. Try cleaning the shower with vinegar and baking soda. It’s time-saving and effortless to have someone help you do your house cleaning chores. It can be an enjoyable activity for you and your family. Or if you don’t have the time to do everything, you can call in a professional to do the trick! You can check out house cleaning prices on google to give you an idea of how much it may cost, but remember it really depends on what you want to be cleaned. Tidying up with an upstairs. You can leave a basket at the foot of the staircase and throw in any toy or items brought down during the day. Once you go upstairs, take the basket with you and unload. It beats going up and down the stairs all day. If you happen to have only a little time to clean before guests arrive, the bathroom is an automatic pick. This is the area where guests spend time solo and thus tend to notice the mess. There are times when your plastic food storage containers absorb the odors from foods that are stored in them. Wash them with two tablespoons of baking soda in hot water. Time flies when you’re having fun! If you enjoy what you are doing, you won’t notice that you’re done in no time. Adding music may help the time to fly even faster. Put your old clothes to use before having them donated or thrown away. You can wear an old sock on your hand to dust the house. Remember, when in doubt, dump it. It will help you reduce your mess and the number of items to dust. You can remove hardened wax by placing a paper towel on the area and use an iron on low heat to press it on. The paper absorbs the wax, and the iron stays clean. Try to use old newspapers rather than paper towels to clean windows and mirrors. Every week, focus on cleaning the rooms that matter the most to you. If you worry about all the places at once all the time, you may feel overwhelmed and very stressed. Washing dishes and fine China. Make a mixture of water and baking soda to fix discolored teapots and teacups. It’s also gentle enough for most fine china. Add a little-uncooked rice to the water while you’re washing narrow-necked glass decanters and vases. It will sparkle! Of course, that is only if you are handwashing them. You can try to motivate yourself to clean by inviting people over. Since the new year is coming, welcome guests over and have your house cleaned!